I am going about creating the "pure" allele frequencies somewhat differently, so that would be a useful exercise. This used the same Principal Component Analysis as the one here using the 96 Indian Cline samples, Utahn Whites and Onge. 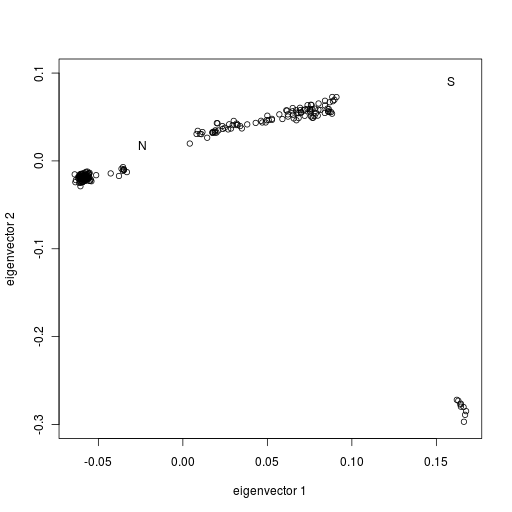 However, I projected three extra "populations" on this plot. These three populations are simulated genetic data of 25 individuals using the allele frequencies from Reference 3 Admixture results. Onge11 is generated from the Onge (C2) component from K=11 admixture for Reference 3. 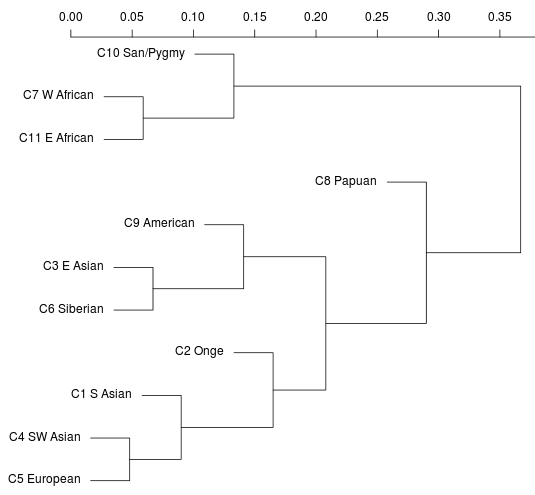 SA11 is generated from the South Asian (C1) component from the same K=11 admixture. SA12 is generated from the South Asian (C1) component from the K=12 admixture. 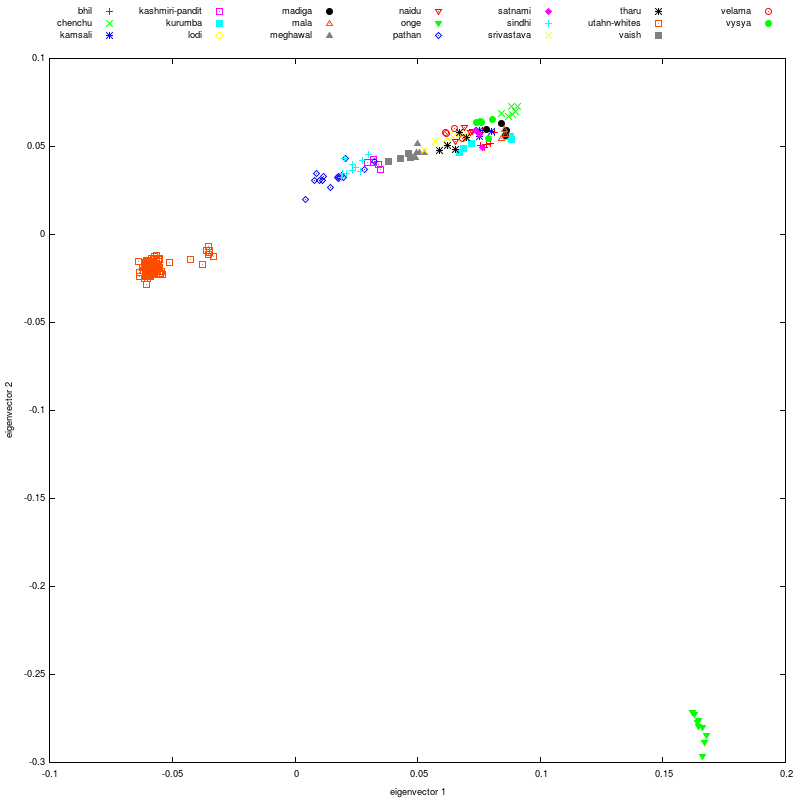 As you can see, the SA12 population lies between 100% ASI and the Indian Cline samples. 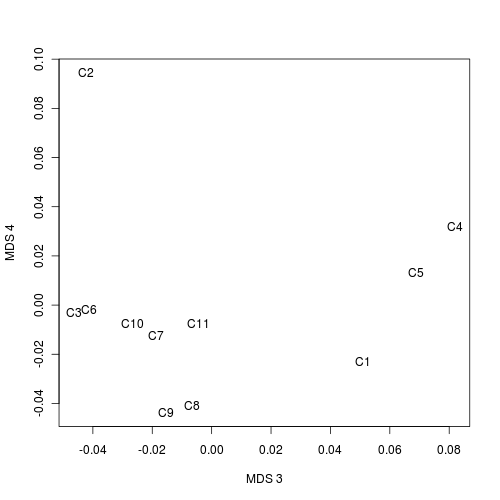 The Onge11 generated samples are a bit beyond 100% ASI on the first principal component, but they are also shifted towards the real Onge on pc2. 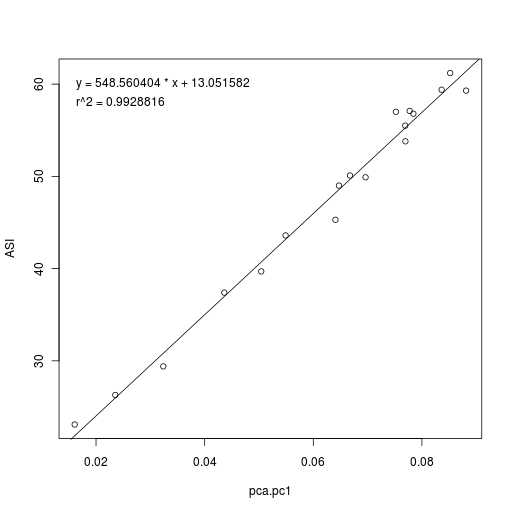 I have been misusing correlation in computing Ancestral South Indian percentages from PCA/ADMIXTURE and Reich et al population-level averages. 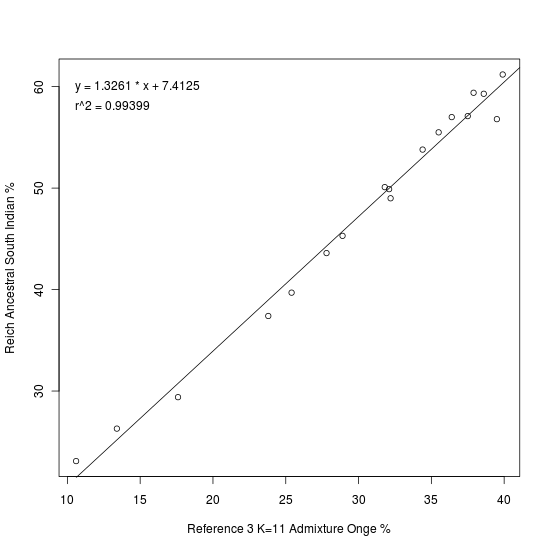 I have tried to make it clear that just looking at the correlation is not enough, that an admixture component is not similar to ASI just because it correlates well with Reich et al's ASI averages for the 18 Indian cline populations. Even when the correlation is higher than 0.99. 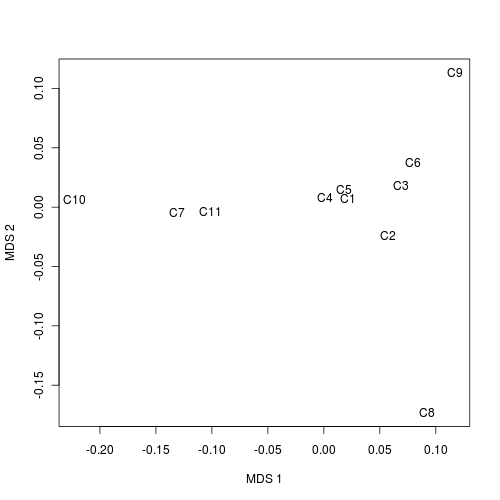 To illustrate what I mean, let's look at the Ref4C admixture runs. Where do you see the highest correlation? At K=3 ancestral populations, the East Asian component is very highly correlated with ASI for the Indian cline populations. Does that mean that we could use that to compute ASI? No, not at all. While it is expected that at K=3, ASI would be a little closer to East Asian than to European, East Asian is not a good proxy for ASI at all since we cannot extrapolate to other individuals and populations. One thing I forgot in the post yesterday about the Indian cline was to try to extrapolate from the PCA results to 100% ANI (Ancestral North Indian) and 100% ASI (Ancestral South Indian). The "N" denotes the extrapolated position of ANI and "S" denotes the ASI. The points to the left of "N" are all Utahn Whites while the Onge are on the bottom right of the graph. 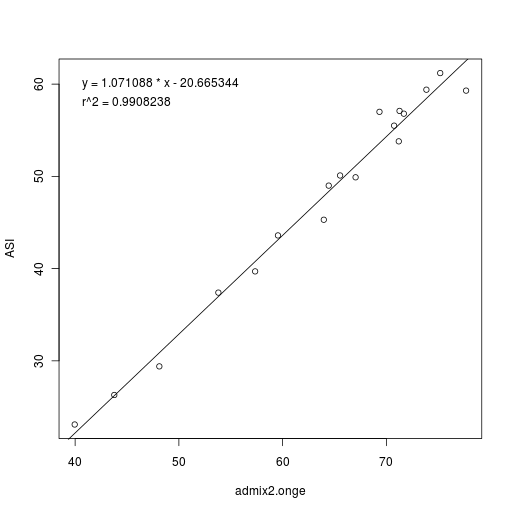 As you can see, the ASI is about the same as Onge in terms of eigenvector 1 (which represents the Indian cline approximately), but ASI is far from Onge on the 2nd eigenvector. That is expected since the Onge have been separated from the mainland populations for a long time. 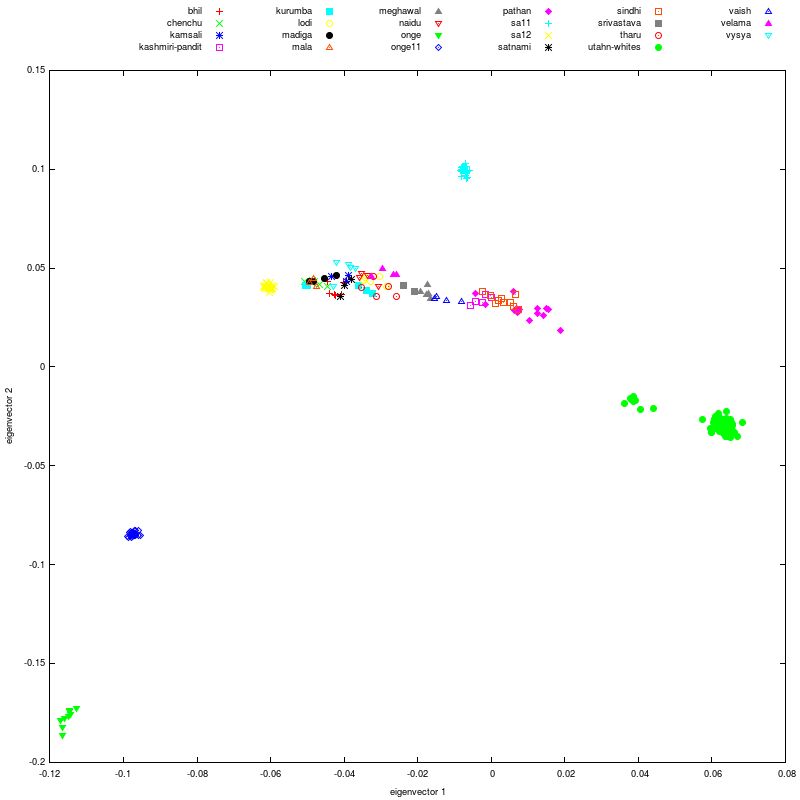 The more interesting thing is that the extrapolated position of ANI is a little to the right of all the Utahn Whites. We'll need a similar analysis of the Indian cline with more populations to see which one the ANI is closest to. PS. 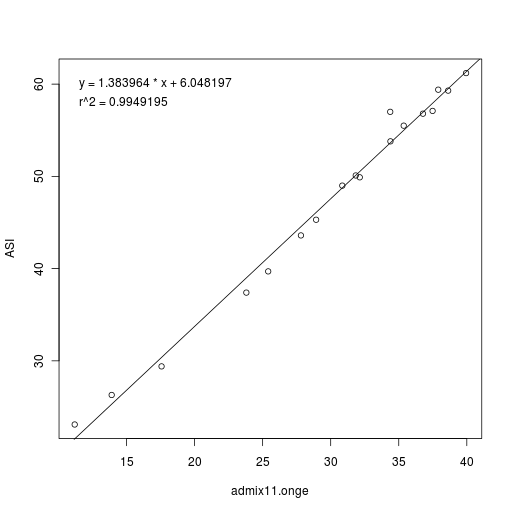 I should point out that I am using correlation between a limited number of population statistics to find a relationship between the 1st principal component and Reich et al's ASI estimate. This has a number of drawbacks. It would be much better to compute ASI directly. Having collected 12 datasets, I have gone through them and finally selected the samples and SNPs I want to include in my new dataset, which I'll call Reference 3. It has 3,889 individuals and 217,957 SNPs. Since this is a South Asia focused blog, there are a total of 558 South Asians in this reference set (compared to 398 in my Reference I). You can see the number of SNPs of various datasets which are common to 23andme version 2, 23andme version 3 and FTDNA Family Finder (Illumina chip). Reich et al had about 100,000 SNPs in common with 23andme (v2 & v3 intersection) and 137,000 with FTDNA, but there was not a great overlap. Only 59,000 Reich et al SNPs were present in all three platforms. Since I really wanted Reich et al data in Reference 3, I included it but the SNPs used for FTDNA comparisons won't be the same as for the 23andme comparisons. Of the datasets I could not include, I am most disappointed about the Pan-Asian dataset since it has a good coverage of South and Southeast Asia. Unfortunately, it has only 19,000 SNPs in common with 23andme v2 and 23,000 with 23andme v3. I am going to have to do some analyses with the Pan-Asian data but it just can't be included in my Reference 3. I am also interested in doing some analysis with the Henn et al African data with about 52,000 SNPs for personal reasons. Xing et al has about 71,000 SNPs in common with 23andme v3, so some good work could be done with that, though I'll have to use only 23andme version 3 participants. The information about the populations included in Reference 3 is in a spreadsheet as usual.